After the fall of the Wall, Modeselektor found its footing in techno. Children running amok, police officers standing idly by while huge parties are thrown in the streets, kids experiencing unprecedented freedom because their parents are preoccupied with life after the fall of the Berlin Wall: You expect to hear these tales while watching the History Channel. Not while interviewing techno producers. 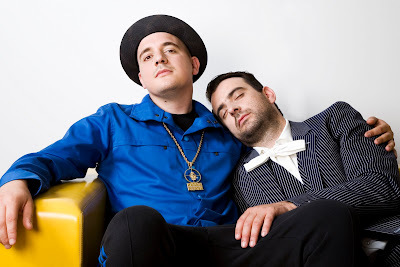 Yet for Gernot Bronsert, 30, and Sebastian Szary, 34, such scenes are integral to the story of how they came to form Modeselektor. When we phoned Bronsert in his Berlin studio in advance of Modeselektor’s performance at the Congress Theater Friday 6, we thought we’d hear stories about being obsessed with records as a kid—and we did—but we also heard about growing up in East Berlin after the dissolution of the Iron Curtain. After East Germany’s liberation, Szary and friends were the ones throwing the parties, and Bronsert was always in attendance. “After I went to my first techno party, it just took a few months and I was one of the DJs,” Bronsert says. It took another few years before Bronsert and Szary started working together. In the meantime, Bronsert studied to be a “street worker”—a loss in translation that leads to a few laughs before we realize he’s talking about social work. To make ends meet, he also worked for renowned record store Hard Wax. “It was like being at techno university,” he recalls. “That was the thing that pushed me in this direction with no way back.” At the same time, Szary worked as a sound engineer for a studio and youth center. Bronsert joined him as part of his dissertation, which focused on constructive outlets for inner-city youth. “By day we produced music for little rappers, and by night we started creating Modeselektor productions,” he says.